Boat ownership offers a wide variety of benefits, allowing individuals to enjoy the beauty of Southern California lakes and mountains, almost year-round. Even in the mountain resorts where snow caps the treetops in winter, the harshness of the colder months is relatively mild. At some point, however, local boat owners may determine that they wish to store their watercraft on dry land. Choosing "dry" storage for a boat may not be as straightforward as it seems. Considerations of whether indoor or outdoor storage is suitable must be made. In many of our local communities, restrictions for residential storage of boats and other recreational vehicles must also be taken into account. For many people in and around the Redlands area, the best option for boat storage is an indoor unit at Vines Storage facility. Because our winters do not produce snow except in a few mountain areas, outdoor storage may seem the ideal solution for keeping a boat safe and secure. While the lower lying areas in Southern California are not typically faced with freezing temperatures, the opposite is more and more concerning. In recent years, we have reached winter temperatures in the eighties. Summertime temperatures have reached over 110 degrees. With warmer temperatures one of the primary concerns, there is reason to consider indoor boat storage. In Southern California, Vines Storage is the largest indoor facility, offering ample room for owners to drive in and out with their boats and RVs safely. Our converted warehouse facility provides outstanding protection for vehicles that may otherwise become musty or damaged under the hot sun. Because boats are watercraft, it is easy to think that they can and should be left in the water throughout the year. Indoor storage may seem an unnecessary step to preserving a boat. After all, this recreational vehicle was made for the water. What new boat owners may not realize is that water storage of a boat means extra maintenance to keep the hull free of debris. Dry-dock storage at a marina is an option. Marina fees, however, can be more costly than necessary. 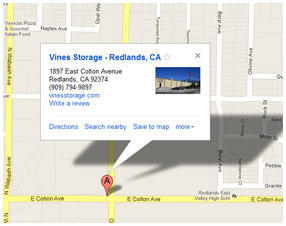 A convenient, affordable option is to take advantage of one of the flexible lease options offered at Vines Storage in Redlands. We are happy to answer your questions about our packages and our facility. Call (909)389-6209.